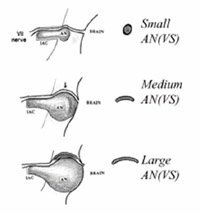 Acoustic neuroma, which is actually a vestibular schwannoma (VS), is a benign, non-cancerous growth on the vestibular (balance) nerve that affects approximately 1 in 100,000 people. Although VS is a tumor of the sheath of the vestibular nerve (schwannoma and not neuroma; vestibular and not acoustic), it has been incorrectly called AN for over 100 years and both names are now considered acceptable. It arises in the middle of the internal auditory canal (IAC) – the bony canal of approximately 1 centimeter in length that transmits the facial nerve, the acoustic (hearing) nerve, and both the inferior and superior vestibular (balance) nerves between the brainstem and the inner ear. The VS can grow outwards and deep, filling the IAC, and displacing the brainstem by gentle encroachment as it grows slowly. 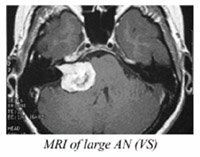 Vestibular Schwannoma (AN) is a slow-growing tumor. It can present with hearing loss, especially difficulty understanding words, but patients can also have normal hearing. Even though it is a growth on the balance nerve, patients rarely complain of dizziness or imbalance until the tumor becomes very large. It is often discovered on routine head MRI scan. What testing is done for Acoustic Neuroma (VS)? 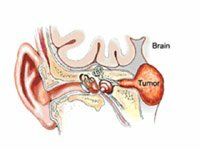 Audiograms (hearing tests) can demonstrate the trouble detecting words or an asymmetry between the ears; more comprehensive testing such as an auditory brainstem response test (ABR) will show delays in hearing nerve conductivity caused by pressure from the tumor in 80% of tumors larger than 1 centimeter in size. 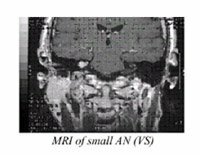 An MRI scan with gadolinium injection will diagnose all tumors as small as 3 millimeters in size. Vestibular testing such as an electronystagmogram (ENG) will be weak on the side of some VS’s that are on the superior (upper) vestibular nerve. What is the treatment for VS (AN)? VS tumors are classified as small, medium and large. Treatment is personalized based on tumor size, hearing status, and patient age and health status. Treatment options include observation with serial MRI scans and hearing tests, radiation (stereotactic, gamma knife or Linac radiosurgery), and skull base microsurgery. Because these tumors are very slow-growing overall but have unpredictable growth rates in the particular instance, it is prudent that, if the patient and physician opt for radiation, the tumor is observed initially with serial MRI scans. Radiation can be instituted if the tumor demonstrates growth. This is because radiation halts tumor growth and does not remove the tumor, and radiation has significant potential side effects, including hearing loss, facial weakness, dizziness, etc. Acoustic neuroma surgery options include suboccipital craniectomy, middle fossa craniectomy, and translabyrinthine craniectomy for tumor removal. Your surgeon performs these surgeries in conjunction with renowned neurosurgeons Dr. Jafar and Dr. Huang at New York University Medical Center. Surgical removal is geared toward total tumor removal with preservation of facial nerve function and hearing preservation where possible. Acoustic neuroma surgery is performed with complete real-time cranial nerve monitoring including hearing nerve and facial nerve monitoring. If you have any questions about the treatment and expectations of an acoustic neuroma please call Dr. Kohan’s office for an appointment at (212) 472-1300.